WordPress - Design - How to delete an extra button? In this article, you will find how to delete some extra Weglot button(s). When several buttons are displayed after using the "In Menu" design feature (from your WP admin > Weglot plugin), you may need to remove the unnecessary versions. First, find an HTML parent tag including the Weglot button you want to delete, but not other(s). Otherwise, all buttons will be deleted. 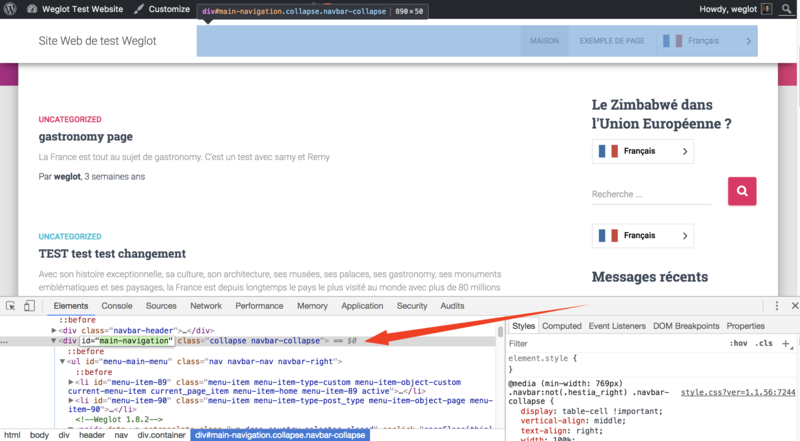 To find it, you can use the inspector of your browser (right click > Inspect Element). As you can see, the main-navigation selector agrees with the situation. Indeed, it includes the Weglot button we want to delete (as the blue area shows), but not the others. No matter the name of the selector, if it's an "id", you must add a sharp "#" before and if it's a "class", you must add a dot "." before. The related extra button is no more displayed. WordPress - Design - How can I change the Weglot button position?